Festival raving family fun for all! Two-time National Family Arts Festival Award winning Big Fish Little Fish host a family festival within a festival at Ally Pally on July 23rd. Join them and legendary DJ Tom Middleton (Jedi Knights, Cosmos, Global Communicaton) at a party like no other for families with children aged 0-8 years (although all ages welcome). Designed as much for grown ups as children they are daft, social, anarchic and a whole load of fun for everyone together. Following sold out gigs across the UK and unique events in places such as the National Gallery and Southbank Centre plus appearances at Glastonbury Festival and Camp Bestival the BFLF family raving phenomenon has a loyal following of family ravers from Aberdeen to Plymouth and this will be their biggest spectacular yet. 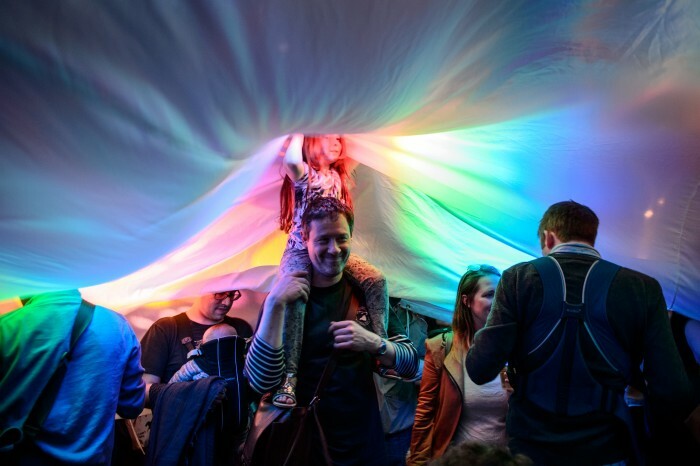 Alongside the awesome music, the BFLF multi-sensory dancefloor experience includes bubbles, glitter cannons, hula hoop displays, huge balloons and a giant parachute dance finale. Get crafty with Captain Cookie and her kids’ craft activities – cover yourself in temporary tattoos, collaborate on a giant colouring mural, create at the play dough table and make festival accessories at the Happy Monkey craft tables and pick up a free Happy Monkey smoothie for every child on the way out. Play and relax in the baby chillout area on mats with tents, tunnels and ball pool (for the littlest ravers). Rockabye Originals free Photo Booth with props. Children’s book reading with author Mark Lemon. Festival Fancy Dress is more than encouraged! Daft, quirky, sometimes teetering-on-the-edge-of-insanity but always a shedload of fun – you can expect upfront tunes spanning all dance genres. Techno, hip hop, house, UK garage, rave, drum ‘n’ bass and some definition-defying curveballs make this the party that starts hard and never stops – well, not until teatime anyway. The licensed bar is open and drinks may be taken into event. It is a standing event with limited seating and will be busy. Max of 3 children per adult, no unaccompanied adults will be admitted.